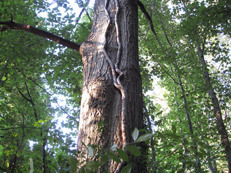 Answer: Climbing poison ivy and gingko trees share recognizable structures in their woody growth habits. Just like the diverse variety seen in the poison ivy seeds in the section ‘seeds and seedlings’, poison ivy plants mature into a variety of distinct recognizable forms. The plants in the photograph below will show how we have used the stable structure of a one hundred and thirty year old gingko tree to understand the very flexible but similar structure of the poison ivy stems and runners. 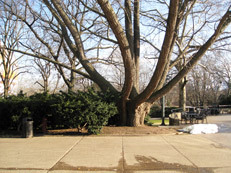 The gingko tree shares a feature in common with a twenty-year-old poison ivy vine. 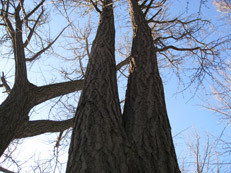 Note that both raise the “V for victory” sign, signaling their status as mature, fruiting plants. 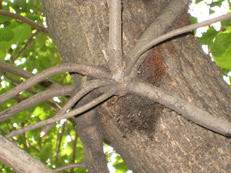 Both gingko and poison ivy node-clutches structurally exhibit up to eight arm-like branches radiating from a single node.